USA Anne Fontaine Online Store: Overview Anne Fontaine is a French women's luxury fashion brand that has expanded internationally. The now iconic white shirt that made this brand distinguishable has grown into business casual apparel for women. With a wider collection bigger than ever, including shoes and accessories. With Big Apple Buddy’s personal shopping service, you can now buy direct from the Anne Fontaine online store anytime, anywhere. 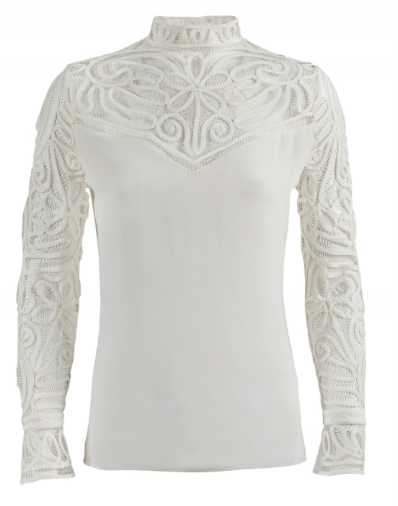 Get one of the most popular designs of the Anne Fontaine classic white shirt! The Regence Embroidered Silk Ribbon Victorian Blouse is a work of art with its intricate design and style. One of the newest additions of the collection, this blouse has already become a classic. With a timeless look and a modern feel, the Regence is perfect for a fancy night out and whatever you combine to complete your outfit. Have fun with the daring Ria Silk Organza Blouse of the Anne Fontaine white shirt collection! This 3/4 sleeve shirt has a unique personality with flowing sleeves and a transparent neck line. It's smooth to the touch and comfortable on your skin and throughout the day. The buttoned opening mid-back is just another way this blouse stands out from all others and is perfect to combine with whatever bottom you like. Steal the night with the Anne Fontaine Noralie Black and White Sleeveless Dress! This chic and contrasting dress is one of the best sellers of the collection. The black and white combine perfectly to compliment your form and make you stand out in the best way possible. With a short and sensual length, this dress is ideal for the summer season and go with any shoes or accessories you throw on. Unfortunately, the USA Anne Fontaine online store does not currently offer international shipping. However, Big Apple Buddy, your personal shopper, can help you buy products direct from the official USA Anne Fontaine online store and ship them to your doorstep, no matter where you are in the world. We offer international shipping to over 190 countries including Australia, Austria, Bahrain, Belgium, Bosnia & Herzegovnia, Brazil, Brunei, Canada, China, Croatia, Cyprus, Denmark, Estonia, Finland, France, Germany, Hong Kong, Hungary, India, Indonesia, Ireland, Israel, Italy, Japan, Kenya, Kuwait, Lithuania, Macau, Malaysia, Maldives, Mexico, Namibia, Netherlands, New Zealand, Norway, Oman, Pakistan, Portugal, Saudi Arabia, Scotland, Serbia, Singapore, Slovenia, South Africa, South Korea, Spain, Sri Lanka, Sweden, Switzerland, Taiwan, Tanzania, Thailand, UAE, UK and Ukraine. If you would like to buy from the USA Anne Fontaineonline store, simply let us know which items you would like to order (by filling out the form on the right) and we’ll get back to you with a free international shipping quote within 24 hours!